Chroma's 63600 Series Programmable Electronic Load integrates micro-processing capability into each load module to optimize the speed and control among multiple load modules. All load modules are configured to work independently, though testing can be carried out simultaneously at multiple outputs via remote control to simulate real life application. The Chroma 63600 electronic load mainframe accepts the user-installable 63600 series load modules for easy system configuration. The model 63600-5 mainframe holds five 63610 load modules to offer up to 10 100W load input channels with standard frontpanel inputs. The maximum power for a single mainframe is 2kW when five 63640-80-80 load modules are paralleled. This is suitable for testing multiple output switch mode power supplies, and many other types of power products. Using the GO/NG output port, production snapshots are made available to show the immediate pass/fail judgment of UUT. All modules on the mainframe share a common GPIB address to synchronize and speed up the control of the load modules and read back the operating data. The 63600 series load modules operate in constant voltage, current, resistance, power, or impedance to satisfy a wide range of test requirements. For example, the CV is designed to simulate batteries for charger testing. The 63600 series provides three operating current ranges and a built-in 16-bit, precision A/D converter, achieving 0.025%+0.01%F.S., 0.05%+0.05%F.S. and 0.1%+0.1%F.S. accuracy for voltage, current and power measurement respectively. Precise measurements like these are ideal for testing power efficiency and other critical parameters of the UUT's. The precise measurement of 63600 series also meets the requirements of ENERGY STAR® and 80 Plus. Besides, The 63600 series can measure OCP/OLP trip voltage and current by setting the step, step current, dwell time and so on. Then 63600 series will judge the test result for Pass or Fail and shows the maximum power (Pmax) on the display after completed the OCP/OLP test. Two high-speed A/D are built in the 63600 series to measure the voltage and current at the same time and calculate the true power value for displaying without distortion. The unique CZ mode des igned in 63600 series can improve the loading behavior of CC & CP mode and makes the simulated loading current more realistic. The 63600 series offers 100 programmable loading sequences that enable the user to simulate various real world conditions. In addition, each module can be operated independently or synchronized so that all modules start operating at the same time while running independent programs. Below are some examples of the most popular program sequences available. Modern electronic devices operate at very high speed and demand rapid transient response characteristics. To address these applications the 63600 offers high speed, programmable dynamic loading, sweep simulation and control capability never before achieved. The right figure shows the programmable parameters which can be set within the 63600 loads: Waveforms can be single shot or set to repeat. The dynamic mode provides a unique simulation capability allowing users to set the number of times each cycle repeats from 1~65,535. Feature is excellent for determining the peak current which can be sustained by converters. The 63600 also offers a unique dynamic frequency sweep with variable frequencies up to 50kHz. This capability is ideal for determining worst case voltage peaks (see Figure 1). Measurement of the Vpeak (+/-) can be achieved by this function with a sampling rate of 500 kHz (Figure 2). The dynamic loading mode can simulate different loading conditions for most test requirements. Dedicated remote load sensors and control circuits guarantee minimum waveform distortion during dynamic loading. According to Intel’s Design Guide for ATX 12V Power Supplies, measurement of output transient response requires simultaneous load steps when testing the power supply’s +12VDC, +5VDC and +3VDC outputs (all steps must occur at the same time). The 63600 provides a dynamic synchronous function that can be used to perform this test on up to 10 outputs within each mainframe. The total dynamic synchronous channels can up to 40 when using 4 mainframes providing higher flexible and increased utility. In addition to the dynamic loading function the 63600 provides Master/Slave (parallel) operation of individual loads. This capability provides for up to 2,000W per mainframe. Figure 3 shows the parallel synchronous dynamic loading and Figure 4 shows the parallel non-synchronous dynamic loading of previous designs. As show, the Vpeak value is significantly reduced and incorrect when using non-synchronous loading. When the need is for increased power, paralleling two or more loads can be done to achieve the desired load current. The 63600 provides the user with smart Master/Slave mode controls which enables the user to program the load currents of the Master and have them automatically calculated and downloaded to the slave modules. Using several loads in parallel to emulate a single load dramatically simplifies operation and allows the 63600 to be used for both multiple output power supplies and larger single output supplies. The 63600 can controlled and reconfigured with USB, Ethernet, and GPIB interfaces for automated testing applications. 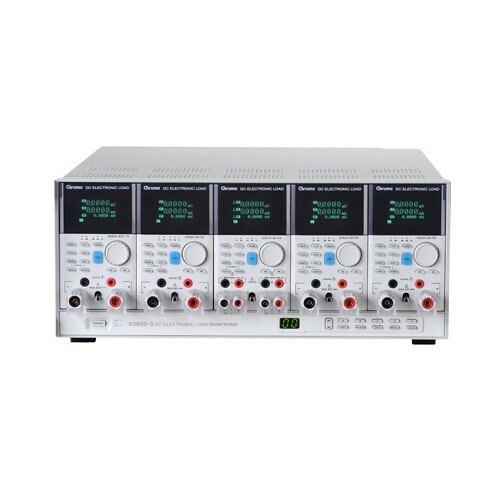 The 63600 has a unique sine wave loading function which allows setting of a current bias (I_DC), a loading sine wave (I_AC) and sine wave frequency without the need for an external function generator. As see in the figure right, CH1 is the actual load current and CH2 is the voltage waveform of the UUT. This function can be used in D2D/ATX Power supplies for sine wave dynamic testing. In addition to common constant current, constant voltage, constant power and constant resistance modes of conventional loads, the 63600 accepts digital data from DAQ cards or analog data from function generators to allow for complex waveforms to be created as depicted below. The 63600 also provides an enhanced feature, User Defined Waveform (UDW), to simulate the actual current profiles and waveforms. In addition, 63600 series also provides voltage peak measurements during actual loading conditions. Avoiding the need for using an oscilloscope to capture the voltage peak, saving time and costs. Each 63600 load module contains 3 load current ranges with a minimum full current operating voltage of 0.5V for each range. At the minimum voltage (0.4V), the 63640-80-80 load can draw maximum current defined by the current range. Based on this design, the 63600 is well suited for testing DC/DC converters, fuel cells, and other low voltage - high current devices. Low voltage operation is possible towards zero volts with corresponding reduced current levels (see de-rating curves).